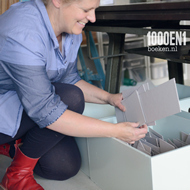 My name is Paula Derksen and I am the face behind 1000en1boeken. I already developed a passion for visual arts and in particular for working with beautiful paper. and took my first lessons in the subject. In 2010, I successfully completed my training in hand bookbinding at the VNH, Vereniging Nederlandse Handboekbinderijen (Dutch association for hand bookbinders). In addition to traditional binding, I have specialised in making photo albums, marriage certificate books, little books, picture frames and custom-made boxes for special occasions. In the future, I want to combine my teaching skills and bookbinding to make others as enthusiastic for these special skills, which she thinks should not be lost! But first I want to do a lot of binding myself and develop my skillset further.